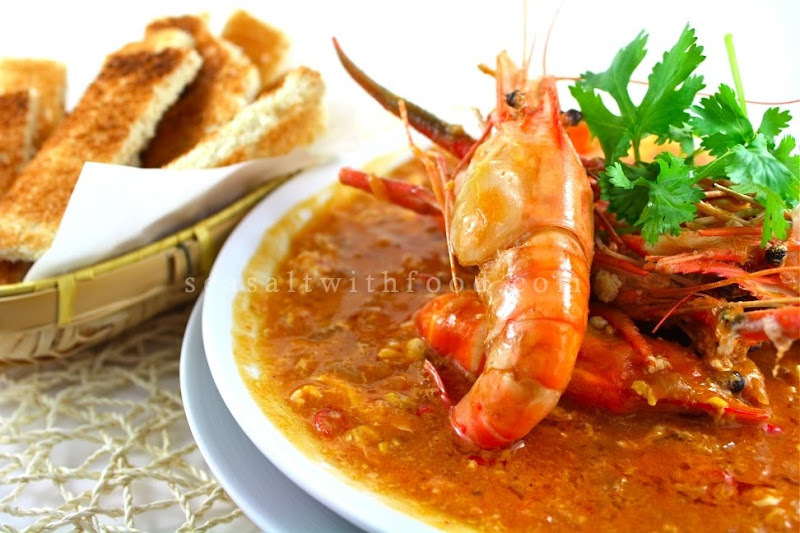 Today, I am posting a River Prawns recipe using the sauce from my Sweet And Sour Chili Crabs. As some of you may know, that sweet and sour chili crab is probably the most popular crab dish in Malaysia and Singapore. So, do you know the key ingredients needed to make that fantastic sweet, sour, and spicy sauce? Well, it's the good old bottled tomato ketchup and chili sauce condiment you have in your kitchen, believe it or not. 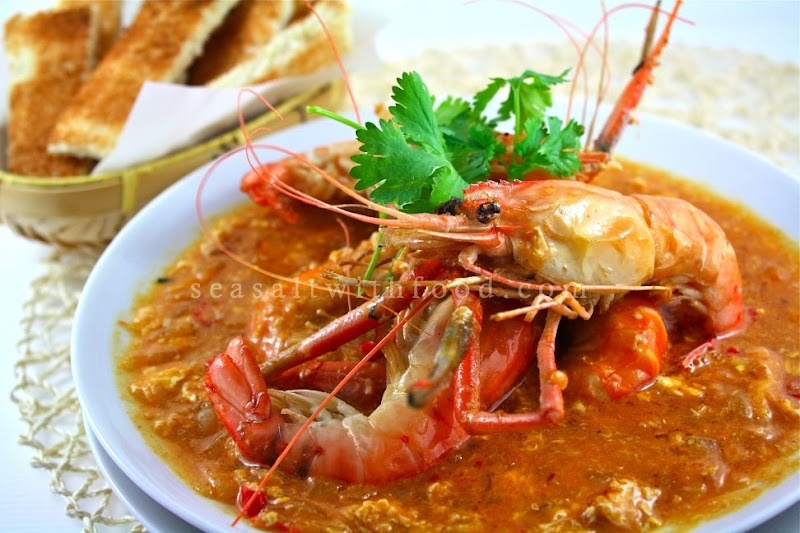 If you can’t get hold of river prawns, then, you can consider using spot prawns instead. These two variety of prawns have a similar texture, the flesh is tender and juicier. 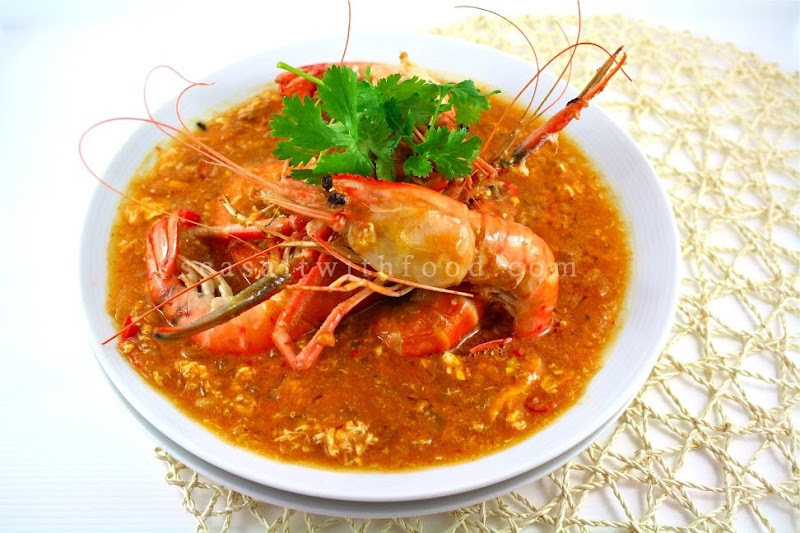 Whichever type of prawns you opt to use, make sure you toast some bread or have some steamed rice to mop-up that delicious sauce. Enjoy! In a large wok over high heat, add enough oil and pan fry the prawns. Then set aside. Remove the oil from the wok and reserve about 2 Tbsp. Turn the heat on medium and add the ginger, garlic, yellow onion and chilies. Cook the mixture until fragrant. Add the prawns and stir briefly. Then add the beaten eggs and stir until all the eggs are cook and well combined. Serve immediately! Ever since I first tasted chilli crab at a hawker market in Singapore, I've wanted to know how to make that sauce. Now you've revealed the secret. I'm jumping for joy! How lovely! I love the pure quality of your photography. I've never seen a river prawn before - wow!! sounds great with the chilis. the sweet and sour and tangy sauce is irresistable!!. great clicks too!. What a gorgeous photo and thank you so very much for the recipes. I've never forgotten the utter deliciousness of the chili crabs eaten in Singapore in the early '90s in one of those strings of open air restaurants along the waterfront! This all sounds amazingingly good,but where can you buy these ingridients,I'm from Singapore and I am desperate to get hold of all these,please help!!!! @Anonymous: I'm not from Singapore but I'm sure you can find the ingredients from the wet market. This is just gorgeous. I cant wait to make this. I love this type of food as it hits every taste bud in my mouth.... Lovely photos.